304 pages | 20 B/W Illus. Debates about multi-level governance have led to a profound restructuring of regional and local government. The second level of local government is under review in most European countries, with the aim to strengthen the institutional capacity of municipalities or to develop appropriate institutional structures for governing fragmented urban areas. Political socialization and recruitment, professionalization and career patterns of county/provincial councillors. This book will be of interest to students and scholars of local government, urban studies, regional studies, political science, sociology and geography. Hubert Heinelt is Professor of Public Administration/Public Policy and Urban Studies at the Institute of Political Science, Technische Universität Darmstadt, Germany. 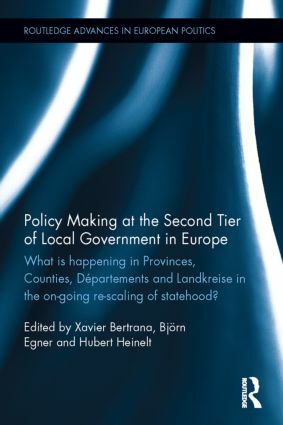 Xavier Bertrana is a member of the Research Group on Local Government, University of Barcelona, Spain. He is also the Head of the Planning and Evaluation Unit of the Provincial Council of Barcelona. Björn Egner is Senior Researcher at the Institute of Political Science, Technische Universität Darmstadt, Germany.